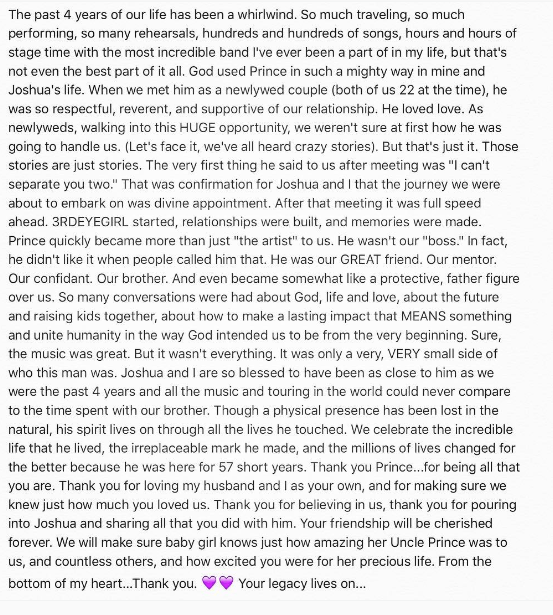 Hannah Ford Welton, the drummer for 3RdEye Girl and the wife of Joshua Welton, Prince’s producer for the last couple of years, has posted a statement to Instagram. The Weltons were part of Prince’s inner circle recently, but haven’t said anything so far about his untimely death. Hannah is pregnant with the couple’s first child, a girl due in September. Prince never let anyone produce his albums in the past. But Joshua Welton became his de facto producer for the HitnRun, Phase 1 album. Welton got co-songwriting credit on most of the songs, too. He also co-produced Art Official Age and worked on 3rd Eye Girl’s PlectrumElectrum album. What a break for such a young guy! Welton may know more about what was ailing Prince but so far he’s remained silent.